High Pressure which was over Britain, has shifted west, will be back overhead tomorrow and for next few days! It was wonderful about 4 or 5 days ago. Cool nights with frost, sunshine and mild temps by day, unless you were in the fog which held daytime highs at or below freezing, then came a return to cloudier, showery and more unsettled weather. Last night was the first in over a week which stayed above freezing, however the moderation in night temps appears to have been short lived. The daytime highs have been nice and mild as the stable anticyclonic weather system which brought the fair weather was of milder Atlantic origin, meaning by night temps are allowed to fall under clear, calm conditions but by day they recover back into the 40s or 5 to 7C! Well the cooler but drier and sunnier weather of some 5 or 6 days ago is back as that bubble of high pressure which shifted west is pushing back in and we’ll see a return to sunny days, clear, frosty nights. What would you rather? I know id rather pleasant, sunny and dry days and nights that become frosty thatn wet, windy weather. Central, Eastern Europe cooling back down, NW Europe staying mild! The recent bout of mild, warm Atlantic winds which have dominated much of central Europe over the weeks which followed the turn to 2011 is breaking down and we’re looking at a return to colder air which will be allowed to filter southwards from Scandinavia which saw little warmth since November. Indeed those typically cold places at this time of year which stretch from Oslo, Stockholm, Helsinki, Riga towards Moscow and Kiev have been cold and remain so and this air will drive into central Europe from Berlin, Warsaw eastwards and south towards Athens with interior, northern snows and cold rains closer towards an increasingly stormier region from Spain to Greece! Look for 6-8C highs in Athens and Rome rather than those 14 to 16C highs, even such southern European cities such as Seville, Spain may see only 6 to 8C and rainy, breezy conditions. Snowier weather will stretch from Geneva, Switzerland through Berlin and Munich, Germany with daytime highs struggling to get above freezing. Though we here in Britain will see lowering temps, the pattern remains “mild” as high pressure re-establishes itself across NW Europe and the storm track shifts south. The colder air bleeding down from the north as our ridge is interior Europe’s trough, opening the door to Arctic air which sweeps down and underneath the ridge and this forces those colder temps even to Spain and Portugal into the heart of central and eastern Europe which will come up against Atlantic moisture flowing underneath the NW ridge. The cold air and moisture infusion will force heavy snows, particularly over the Alps! 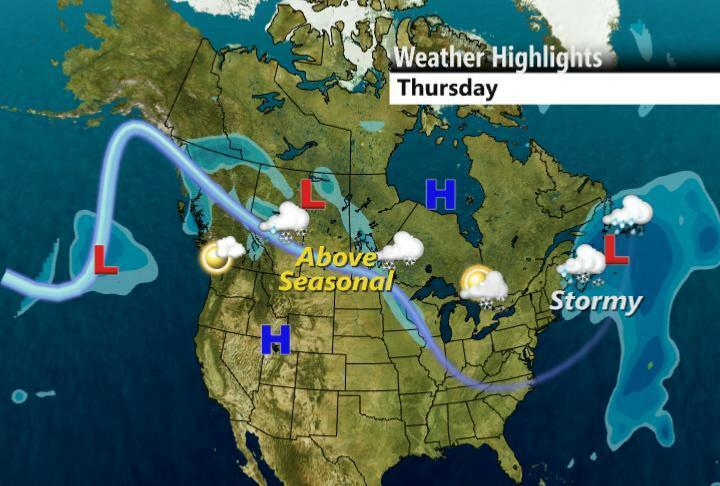 JET STREAM TO BLAME FOR WHITEHORSE WARMTH AND OUTSTANDING OTTAWA COLD! How cold was it? 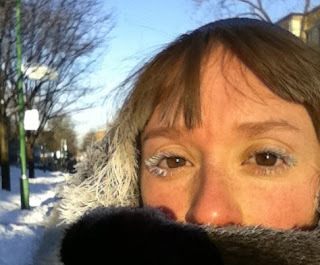 Cold enough for eyelashes to freeze in Montreal on Monday. It was -17°C before the wind chill. With all the brutal cold air centered yesterday morning over a region from Hudson Bay, all the way down to New York and Philadelphia. 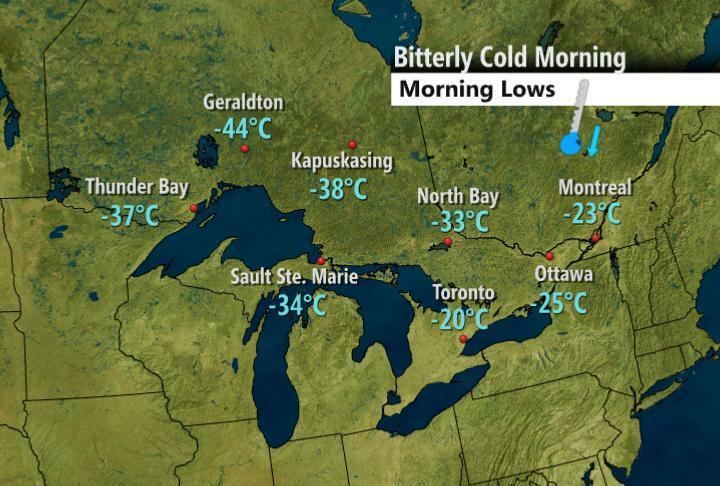 Over the vast expanse of Ontario and Quebec, temperatures were under -40C in spots, worse with windchill. Some frigid snowcovered valleys of Vermont, New Hampshire and deep within the Adirondack Mountains of northern New York, temperatures dropped between -35 and -40C/F. There must have been places that were warm right? Well, yes! Would you believe that whilst it was a chilly -20C or -4F in Ottawa, Ontario this morning where it was snowing, at the same time, it was only 0C/32F at Calgary and -5C/23F up in Edmonton both in Alberta province. Better still it was 0C, yep, only freezing point, all the way up in typically frigid and frozen Whitehorse, Yukon. In fact warm air covered a large area of Western Canada, a section of this vast land which can endure the coldest values in the country. Above freezing daytime highs and only a little below freezing at night was the weather story for many areas of British Columbia, Alberta and even Saskatchewan. Why so warm in the “coldest periof of the year”? Blame a ridge of High Pressure which built up the western side of the continent. This opened the door to mild, Pacific air blowing literally all the way north into the frozen tundra of the Yukon and NWT. All the cold, typically there and in the -40 to -50C range was shoved southbound down the eastern flank of the continent, thus sending -30s and -40s into southern Ontario, Quebec and the Maritime provinces. 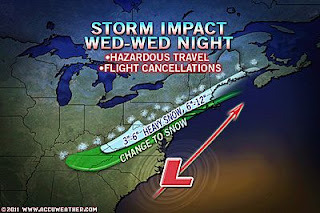 When this type of weather setup occurs, it is caused by what is known as a “highly amplified jet stream pattern”. That cold air must go somewhere when displaced by the jet stream orientation. With the upper-level winds which blow at 100+mph at 37 to 47,000 feet above our heads, they not only transfer thermal energy (temperature) but also air masses. The stronger the jet stream flows aloft, the faster it can move air from one location to another. The faster air travels, the less it moderates away from it’s source temperature. Meaning, Pacific air flowing rapidly, cools less the further north it goes where sunshine at this time of year, north of the Arctic circle is nonexistent. At the same level, the faster Arctic air can be transported by the jet, the less it will also weaken. The combination of “collapsing pressure heights” with the “building of Arctic high pressure” and the displacement of the polar “Hudson Bay” Vortex south towards New England, as well as brilliantly clear, brutally cold skies and solar rays from the sun that was all but lost to the vast reflective snowcover, this meant maximum cooling by night. The lower the night lows dipped, the less of a recovery by day! These “perfect conditions” meant -40s in areas far far away from ocean, sea or lake warmth influence. The key cold spots were central Ontario, between Hudson Bay and the Great Lakes and interior southwest Quebec away from both the St Lawrence River Valley and the Great Lakes. A secondary “cold avenue” was the deep snowcovered valleys of upstate New York, northern Vermont, New Hampshire and northwestern Maine, near the New Brunswick border. Here temps dipped well into the -30s. 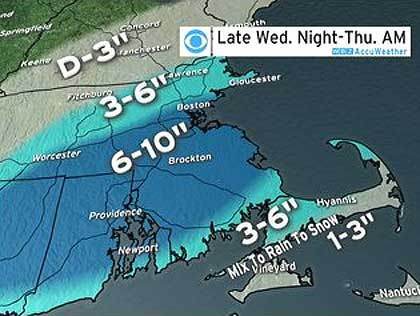 Calm and cool conditions expected throughout the week, but… COLD might be back in 10 days. Beautiful day around Monterrey today with temperatures expected to reach 24°C and with clear skies. Calm weather is common around the city and in general over NE Mexico, a cold front will be arriving later tonight and a stronger one on tuesday making temperatures drop into the 5-8°C range as for lows having as highs 15-20°C throughout the week. Some moisture might be popping into the region by tuesday, so some scattered showers are plausible. This January has been running below normal, specially due to last week extreme cold that created ice and sleet conditions for most parts of the region above 4000 feet. Since the last 4 days, the GFS has been consistently calling for a brutal period of cold weather throughout Monterrey and NE Mexico for the first week of February. The GFS is even calling for upto 10-18 OUTSTANDING INCHES OF SNOW!!!!!! Even though, the GFS is known for its wild contrast from one run to another, it has been really consistent in showing a period of extraordinary cold weather for the first week of February with temperatures running below zero for several days. CHECK OUT ARTURO’S BLOG HERE!